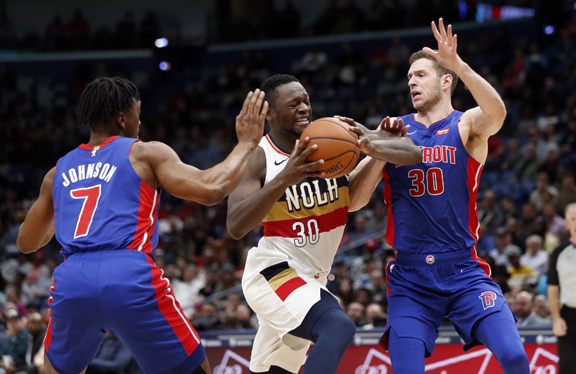 NEW ORLEANS (AP) — Blake Griffin got Detroit off to a hot start, but the Pistons still had to scratch out a 98-94 victory in the final seconds over the Anthony Davis-less Pelicans. It didn’t sit well with the All-Star forward. Griffin scored 20 of his game-high 37 points in the fourth quarter. Reggie Jackson added 17 points for the Pistons, who had lost seven of their previous 10. Jrue Holiday scored 29 points and Jahlil Okafor added 17 for the Pelicans, who have lost four of six and played their second straight game without Davis. The Pistons then had a sluggish possession, finally getting the ball in Griffin’s hands for a forced 3-point attempt. When he missed, the Pelicans had a chance to tie, but Frank Jackson’s open 3-pointer missed, and Holiday tapped the rebound out to the top of the key. “He’s carrying us, handling the basketball, making good decisions, just doing everything we could ask a franchise player to do,” Detroit coach Dwane Casey said.